Excursion to the Mill House, Bromley by Bow, by Jane McChrystal. Head from the gleaming towers of Canary Wharf on the D8 bus towards Stratford, out along the East India Dock Road, through Poplar and then on to the Northern Approach to Blackwall Tunnel, a stretch of the A12 notorious for congestion and its appalling air quality. We made the journey one Sunday morning in July during this sweltering summer, in the hope of reaching our destination before the heat of the day set in. We got off at Grace Street, made our way back to the A12 and went down into the underpass which leads to the Tesco Superstore. The subway was occupied by two rough sleepers, wrapped in all they possessed, tight up against the walls, surrounded by litter of the kind which seems to be the trade mark of resting places for those with no home to go to. At least a pocket of cooler air was trapped in their refuge, even if it was some of the most toxic to be breathed in London. Above ground again we spotted a street sign, Three Mill Lane, which runs alongside the superstore, the first clue to the presence of something unusual concealed within this most urban of landscapes. As we skirted one side of the Tesco car park and started to cross the bridge over the River Lea, there was still no sign of what it could be. But as we crested the bridge, there it was, the splendid Eighteenth Century Mill House, five storeys high, its long façade clad in brick, broken at regular intervals by twenty five sash windows divided by glazing bars in typical Georgian style and topped off with a steeply pitched slate roof. There’s no other way to say it – we were in a different world – one with a clock tower and two oast houses, paved with cobble stones. A little early for the guided tour, we waited in the garden at the back of the mill where we watched a duck and her ducklings, some geese and a single moor-hen dabbling in the water, while pigeons attacked fat balls hanging from a tree, possibly intended for a more rarefied sort of bird. Paula Duggan, our knowledgeable guide, welcomed us to Mill House and began our tour with a brief account of its history. The first record of a mill on this spot appears in the Domesday Book and the one which stands today was built by Daniel Bisson in 1776 to grind cereal for flour and gin. 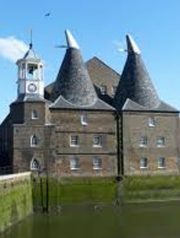 Its strategic position on the River Lea and close to one end of the recently-constructed Limehouse Cut Canal made the mill the ideal location for the transport of grain from East Anglia and the distribution of the finished products to wherever they were needed. Paula led us up to into the roof of the mill, which inside its brick and slate wrapper is, in effect, a great wooden box. Here, the grain was hauled up to the top, where it was spread on the floor and cleaned of ergot to make it fit for consumption. As we went from floor to floor, she described the descent of the grain through hoppers onto the mill-stones of super-hard French limestone to be ground into flour and how it was let on down again, to pour into sacks. Then, she took us into the depths of the mill where water, released from the sluice at the back, used to rush through and turn the wheels to generate the energy needed to power the machinery, which drove the entire operation. It’s all too easy for the visitor today to conjure a vision of the mill as a woody cocoon, a bucolic retreat from the gritty urban world it stands in. Paula dispelled any romantic illusions we might have harboured with her account of what it was like to work there. When the mill was in motion, the noise of the water, machinery and grinding stones would have been tremendous. Adults and children laboured side by side in conditions which presented both immediate physical dangers and long-term health risks. There was no escape from the flour dust which pervaded the air, causing irritation in the nose and eyes and, more seriously, asthma and other potentially life-threatening diseases. Then, there was the ever-present danger of a flour explosion. Flour packed in a bag or a sack is safe enough, but when the particles of glucose it contains are airborne, it becomes highly combustible. It only takes one spark, say, from grinding millstones, to set a whole building ablaze in seconds, especially one built largely of wood. And, of course, there were all the usual hazards of work in any factory, where limbs can be crushed by falling objects or mangled in the moving parts of machinery. Despite the industrial environment where the mill workers laboured, their pattern of life was largely determined by fluctuations in the forces of nature. The mill’s sluice filled when the water of Bow Creek rose, as water flowed in from the Thames at high tide. The mill could only operate for around eight hours at a time when water rushed from the sluice to turn the paddles at low tide. Consequently workers’ hours had to fit in with ebb and flow of the tides which, in turn, were affected by the changing seasons, the cycles of the moon and surges in the North Sea, and, since these fluctuations aren’t entirely predictable, they had to live close to the mill, ready for anything. The mill produced its last bag of flour in 1940 and, although in use as a warehouse, stood neglected by everyone except vandals until the 1970’s, when it was scheduled for demolition and conversion into a car park. It was spared, and rescued later by The Lea Valley Tidal Mill Trust which owns it today. Despite the extraordinary efforts at restoration carried out by the Trust, the future of the Mill House is far from assured. This Grade 1 listed building, the largest tidal mill in the world, is registered “at risk”. It relies on a dedicated band of volunteers for every aspect of it maintenance and operation. It needs more volunteers, donors and visitors if it is to survive and realise the Trust’s ambition to turn it into a working mill once again. House Mill is not the only treasure concealed among the salvage yards, warehouses, industrial units and housing estates sprawling around the A12. On our return journey we saw the fine Georgian façade of Bromley Hall, whose origins stretch back to the Sixteenth Century, and the Edwardian splendour of Poplar’s ex public library, now stranded on one side of the dual carriageways which cleaved in two the district of Bromley by Bow in the early 1960’s, and swept away its position at the heart of an East End community. Edvard Munch ‘Love and Angst’. Review by Barbara Lewis. Swinging London: A Lifestyle Revolution. Review by Barbara Lewis.